India’s foreign policy has become increasingly contested in domestic Indian politics, calling into question some of the assumptions and expectations that American policymakers may have about the future of US-India relations. 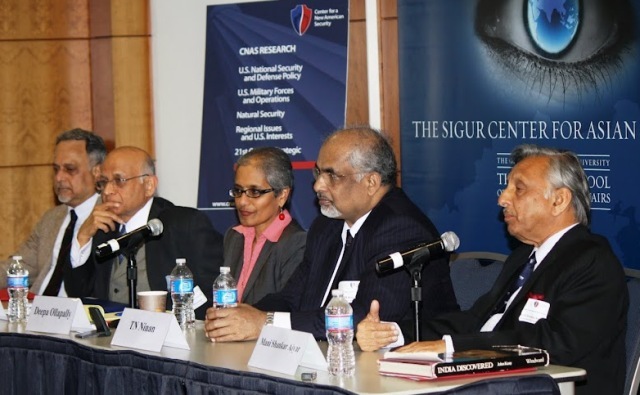 This divergence in opinion was highlighted at the “India as a Global Power: Contending Views from India” conference, which took place on January 23, 2012 and was co-sponsored by the Sigur Center for Asian Studies and the Center for a New American Security. The conference’s Indian speakers disagreed on a wide range of issues, one of which was the question of India’s threat environment. Bharat Karnad, Professor at the Center for Policy Research in New Delhi, identified China’s military build-up and proliferation activities as the top threats to Indian security. Former Indian Foreign Secretary Lalit Mansingh also expressed grave concern over China’s naval presence in the Indian Ocean, though he did not consider it an imminent threat. How do the domestic policy debates within rising powers such as Russia, India and China help us understand current political developments and foreign policy behaviors of these countries? As part of an ongoing outreach to the policy and media communities, the Rising Powers Initiative held a briefing on March 2 to present expert analysis of domestic debates and recent policy developments in Russia, India and China. The event took place at the Elliot School of International Affairs, and was sponsored by the Carnegie Corporation. To understand the foreign policy behaviors of major countries in Asia and Eurasia, the main approach of the Rising Powers Initiative has been to focus on the domestic debates taking place within these countries. These debates reflect a certain intellectual orientation in a country, or its “intellectual DNA,” which is then reflected in that country’s foreign policy, explained Henry R. Nau, who moderated the panel as co-director of the Rising Powers Initiative and Professor of Political Science and International Affairs at The George Washington University. Moreover, domestic debates matter most when the external geopolitical environment is relatively stable, said Nau. For the past twenty years, international relations have been characterized by the unipolarity of the United States, and any shift in the international order is gradual. This brings into focus the domestic interpretations of such shifts, and how those interpretations shape the overall direction of a country’s foreign policy.